Along with sake and shochu, Japanese plum wine, or umeshu (梅酒) is one of Japan's iconic liquors. Now that we have covered local beers, local sake, and local shochu, lets take a look at how to find a quality bottle of umeshu. Umeshu bares the distinction of being one of the easiest liquors to make. In in simplest form, umeshu consists of shochu (although a variety of liquors can be used) and unripened Japanese plums (ume 梅). However, there are some variations on brewing methods and types of alcohol used to steep the plums and the length of time to do so. Umeshu is famous for its sugary-sour taste and it can be drunk straight, chilled, on the rocks, or even slightly heated. However, it doesn't make for much of a cocktail mixer aside from sours. Umeshu and sake are often a necessary accessory for hanami (花見) cherry blossom parties and summer festivals. While there are some varieties of ji-umeshu (地梅酒), there is no particular brewers union or trade group. 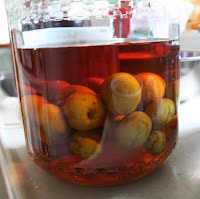 Shochu- Japanese plums soak in shochu. One of the most common brewing varieties. Quality is generally proportional to the type of shochu used and the amount of time it has been steeped. Sake (AKA Nihon-shu)- Since Japanese sake is already sweet by nature, this brew of umeshu tends to be one of the most syrupy. White Liquor (ホウイトリカー)- "White liquor" usually refers to any clear spirits such as vodka and gin. However, in the case of umeshu, it refers to a special blend of clear, fowl tasting alcohol sold in most Japanese supermarkets expressly for the purpose of brewing umeshu at home. Commercial manufactures also use this blend when making umeshu. Brandy- While not super common, brandy steeped umeshu is not unheard of. It tends to be very expensive compared to other brews. Kosei-ha (個性派)- Loosely translated as "individual factions," this is basically umeshu craft brewing. These varieties can be made with everything from brown sugar to mirin (Japanese vinegar). This also include umeshu mixes like strawberry tinted and yuzu (Japanese persimmon) infused umeshu. So where can you get the best glass of local umeshu in town? Probably from old lady next door. Many Japanese families brew their own umeshu and umeshu brewing kits (i.e. a big plastic tub) can be bought just about anywhere. The only catch is that it takes a lot of semi-ripe plums (over 1 kg) and a lot of time (3-6 months) to make. However, homemade (jikasei 自家製) umeshu makes for great gifts and, after all, there's nothing quite like drinking your own homemade liquor. But if you are looking for something a little more fancy, the best place to look is a liquor store or local souvenir shop. Supermarkets generally stock umeshu but they tend only to carry one or two big brands. Online shops like Gosenya have a pretty solid selection divided by maker and liquor type. Don't forget to check out our articles on local beer, local sake, and local shochu just incase you need something to wash your umeshu down. Also check on Facebook and Twitter for your latest AJ fix!